This poster for today's field day describes what happened when we planted five grass varieties as stolons and then supplied irrigation with different amounts of salt in the water. I think two things might surprise you. First, some of the grass varieties, including a particular manilagrass (Zoysia matrella), can reach full coverage in about one month after planting. Second, irrigation with salty water, so long as enough is applied, doesn't slow down the growth of many warm-season grasses. When the grasses can grow like this, it shows that managing the problems with water quality are closely tied to the quantity of water supplied. I will be talking more about this tomorrow when we are back for another day of seminars. When Eric Reasor came to Thailand in July, he brought along measuring tools to assess how golf balls roll across putting greens. He visited 22 golf courses in 5 days. Here's a map with the locations visited marked as an orange ⊕. The primary measurement he made was rolling balls using a customized Perfect Putter, so that all balls were launched on their roll at the same line and with the same pace. Each ball was marked where it stopped. Then the width and length of the dispersion area was recorded. Sometimes the balls dispersed a lot before they stopped. On other rolls, or other greens, the dispersion was relatively small. The purpose of the project is to study what factors influence the dispersion of the ball as it rolls across the green. Is it the grass species? Is it the mowing height? Do off-type grasses affect the dispersion? Is it something else? This is all part of his research about bermudagrass off-types. For an overview of this problem, see Reasor et al. on the genetic and phenotypic variability of interspecific hybrid bermudagrasses (Cynodon dactylon (L.) Pers. × C. transvaalensis Burtt-Davy) used on golf course putting greens. As we traveled around central Thailand, we got to see all the major species used as turfgrass in this region. For more about that, see What grasses are growing on golf courses in Thailand? Here's a few notes about what we saw in July. Seashore paspalum must be maintained with a relatively rapid growth rate in this climate. If paspalum is not kept growing, it will be overtaken by other grasses. Therefore, a lot of work is required to keep paspalum surfaces in a playable condition, and we saw verticutting on paspalum fairways to manage the organic matter. There are lots of birds on Thailand golf courses. These are Asian openbill and a little egret. I haven't identified this bird yet. Bermuda greens and seashore paspalum fairways are pretty common around Bangkok. Manilagrass (Zoysia matrella) is even more common. Let's call it ubiquitous. You can find it at the airport, along the expressways, in lawns, on golf courses, and on football fields and tennis courts. This is bermuda on greens with the nuwan noi variety of manilagrass on fairways. The fairway would have been planted to bermudagrass, but over time the nuwan noi comes to dominate the sward. In parks, palace lawns, and temples, one tends to find tropical carpetgrass (Axonopus compressus) under the trees and nuwan noi manilagrass in full sun. For more about the grasses on lawns, see this post about climate and this one about botanizing in Bangkok. We were lucky with the weather for that time of year. With 22 golf courses visited, we got rained out zero times. Normal weather in July at Bangkok will have 155 mm of rain and 13 rainy days. We saw a bit of rain, but not enough to interfere with our work. It was plenty warm. These are temperatures and heat indices at the time I collected data at 19 of the courses. It was only less than 30°C twice. What a great place for a tropical holiday! Or in this case, for 5 days of intensive data collection. I spoke at the Sustainable Turfgrass Management in Asia 2016 conference about light at different locations. The presentations slides can be viewed here, or embedded below. For more about the conference, which saw 278 delegates from 24 countries and 5 continents travel to Pattaya this year, see this post at the Asian Turf Seminar site. Light is important. Without enough light, grass won't grow well. I suggested that "no-problem" daily light integral (DLI) values for putting greens of bermudagrass, seashore paspalum, and zoysiagrass, may be about 40, 30, and 20 respectively. And I showed what PAR is, and how PAR is measured in one second as the photosynthetic photon flux density (PPFD), and then how all the PPFD over the course of a day are added together to make up the DLI. I showed charts for one day, and also animated charts that show PPFD and DLI for every day of the year. This chart shows the maximum expected PPFD by time of day, and maximum possible DLI by day of the year, at Tokyo and Bangkok if there were no clouds. You may need to click the browser's "refresh" button to play these animations. I wanted to visualize how these maximum possible values, on days when the sky is clear and about 75% of the extraterrestrial radiation reaches the earth's surface. To do that, I looked up the global solar radiation for Tokyo for every hour of 2015, converted those values to PAR units, and plotted them together with the maximum possible values assuming 75% transmittance of extraterrestrial radiation. That is plotted here. I also explained that the global solar radiation has a large influence on the evapotranspiration (ET). I demonstrated this ET calculator that uses the Hargreaves equation to estimate the ET based on global solar radiation. I wrote about three things one can learn from soil testing in this post. Here, in part 2, I discuss four more things related to this subject. The seashore paspalum plots on the driving range tee at Siam CC Waterside Course. 4. Grass can grow well and produce a high quality surface across a range of soil chemical conditions. Don't forget the importance of light, water, soil air, and mowing. By comparison, soil nutrients are simple, and there is more leeway for variation in soil chemical properties. These plots were very low in calcium and magnesium by any interpretation, had potassium above the MLSN guideline but lower than conventional guidelines, and the pH of the plots was from 4.9 to 5.5. Even with these conditions, the grass is good. 5. Sand is a horrid growing medium for plants. The CEC is really low, the micronutrients are low, the accumulation of organic matter that is so beneficial in a normal soil actually causes problems with a sand, the pH is usually not well-buffered -- there are a lot of things not to like about sand as a nutrient supplying medium for turf. The soil tests on these test plots show this. 6. Available nitrogen (nitrate + ammonium) was pretty much the same for each plot, no matter the N source supplied (or not). There was 8.7 ppm N in the control plot that received no N, 8.3 ppm in the urea plot, 7.2 ppm in the 19-0-19 plot, and 6.3 ppm in the 15-0-26 plot. It is interesting that the control plot actually had more N than the plots that received N fertilizer. One would need to run a lot more samples to determine if this was just by chance, or if there is some cause for this -- a difference of 2 ppm in real terms is tiny. What we saw at the field day was grass that looked pretty much the same, no matter the fertilizer. When the conditions are right for mineralization, and when there is enough organic matter in the soil, N fertilizer may not be required. The control plot here looks just as good as the plots that received N, and the soil N was pretty much the same in all the plots. The plots at the field day all had similar color, indicating that the nitrogen supply to the grass was similar in each plot. 7. For many nutrient experiments, it is difficult to see treatment effects when they are not done under controlled conditions. There were visual differences between the plots a month before the field day, after the first application of fertilizer treatments. But management of the turf, especially the irrigation applied to make sure everything looked at its best for the field day, seems to have increased N mineralization in the control plot and thus all the grass was supplied with enough N and K no matter the treatment. Doing experiments under controlled conditions is an easier way to detect small differences in treatment effects, if those treatments have only a small effect. These demonstration plots were set up to use as a discussion point for the experiment about N:K ratios conducted under controlled conditions, described in this poster, this handout, and in these slides. We collected soil samples after the first application of fertilizer treatments, and before the second, and sent them to a lab for analysis. Unfortunately, the results came back to me the day after the Field Day, so I wasn't able to discuss them there. But the results were illustrative of a some points about soil testing I would like to make anew here, and others that I'd like to reiterate. I'll start with three in this post. 1. One really should do soil tests on a regular basis. I suggest once a year will be sufficient frequency for the average facility. If tests are not done, there is no way to know the conditions in which the grass is growing. On the tee where we had these demonstration plots, the soil pH ranged from 4.9 to 5.5; I suggest maintaining soil pH at 5.5 or above in most cases. And in these demonstration plots, the soil calcium (Mehlich 3 extractant) ranged from 155 to 246 ppm, way below the MLSN guideline of 331 ppm. And the magnesium in the soil (Mehlich 3 extractant) was even lower, from 25 to 41 ppm -- all demonstration plots were way below the MLSN guideline of 47 ppm. 2. The MLSN guidelines are conservative. I've mentioned that before, and this is a good example of that conservatism. If you were at the Field Day last week, you saw that the seashore paspalum on that driving range tee looked pretty good. If you weren't there, you can see from the photos (provided courtesy of Dr. Rujira Deewatthanawong) above -- it looked green, actively growing, divots filling in quickly, a dense sward -- the turf was performing well and did not appear deficient in any nutrients. Yet the soil calcium and magnesium were both below the MLSN guideline. One meaning of conservative is "(of an estimate) purposely low for the sake of caution." In the case of nutrient guidelines and the resultant fertilizer recommendations, we want to avoid a deficiency, so we could say also that an estimate is purposely high for the sake of caution. That is, a conservative estimate is one that errs on the side of caution. Are the MLSN guidelines too low? This driving range tee, at which the grass performance was fine, but soil Ca and Mg were way below the guidelines, is an excellent example of this conservatism. One can look at the turf -- Ca and Mg aren't really required as fertilizer here, because the grass performance is fine, and the soil is supplying enough of those elements to produce high quality turf. But using the MLSN guidelines to calculate the fertilizer requirement, I would recommend application of 25 g Ca m-2 (5 lbs Ca/1000 ft2) to supply enough Ca to reach the MLSN guideline. And using the MLSN guidelines to calculate a Mg requirement, it would be 5 g Mg m-2 (1 lb Mg/1000 ft2). That's what I mean by conservatism. Even though the MLSN guidelines are way lower than conventional guidelines, it is the conventional guidelines that are set almost impossibly high. The MLSN guidelines are much lower, but they are still conservative, in that for the sake of caution they will recommend application of elements that are unlikely to cause an improvement in turf performance. 3. Supply of nitrogen (N) really controls nutrient demand. This is embedded into the fertilizer requirement calculations that one makes when using the MLSN guidelines. And the fertilizer treatments and amount of K applied and remaining in the soil in these demonstration plots illustrates that demand. In the control plot, where no N or K was applied, the soil K (Mehlich 3 extractant) was 62 ppm. In the plot to which urea was applied, the soil K was 41 ppm. Why was it lower? Well, because the added N stimulated growth and increased the grass demand for K. And in the plot receiving the 19-0-19 fertilizer, the soil K was 48 ppm. How can it be, that a plot receiving a 19-0-19 fertilizer would have a lower soil K than the control plot? It's because adding N increases the uptake (root uptake = soil depletion) of K. It was only the 15-0-26 plot that got soil K elevated above the control plot, to 71 ppm. Of course, we didn't see much of a difference between the plots, on the surface -- all the turf looked good, and looked pretty much the same. But in the soil, there were differences, and they were related both to how much K had been applied to the plots, and also, whether N had been applied. Those data are plotted below, and the color of the points indicates whether N was applied to that demonstration plot, or not. At the Sustainable Turfgrass Management in Asia 2015 field day, I spoke about nitrogen to potassium (N:K) ratios as applied to manilagrass, bermudagrass, and seashore paspalum. 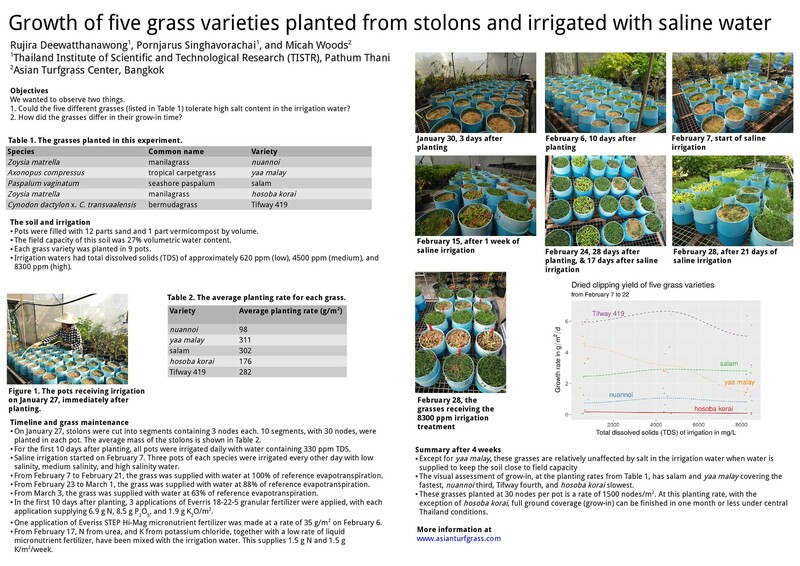 We showed this poster, describing an experiment conducted in Thailand, and also showed fertilizer test plots on a seashore paspalum driving range tee. For more information about this project, see this handout on Fertilizer & N:K ratios. Does sandcapping affect playability? And does species selection? Length and par. Not every course has to be par 72 and more than 7000 yards. Far from it! Where do I come in? I'm going to hone in on the ground contours part, and discuss how the soil and grass conditions affect how a ball will bounce and roll. One can design and build all these great features, but if the sward isn't right, the playability won't be either. A quick summary of my thesis is this -- sandcapping ain't so great because once one introduces a sand profile, the organic matter must be managed or it will fail. That happens by default for putting greens -- usually -- but almost never on 10++ hectares of fairway turf. And using grasses that don't die allows one to apply less N and water. That leads to firmer surfaces that are better to play on when one wants ground contours to be interesting. Here are three ways to follow along. Second, I shared a 2 page PDF handout at the seminar. Download it here. Do fairways need a sandcap? article by me in Asian Golf Business, 2008. The USGA Green Section Recommendations for a Method of Putting Green Construction in which you will see that the sands used in this method have a capillary porosity (water-holding capacity after gravitational drainage) of 15 to 25%. Purchase the Water Movement Through Soils video by Gardner from the Crop and Soil Sciences Department of Washington State University. Aeration and topdressing for the 21st century by O'Brien and Hartwiger. The Built-Up Sand-Capped Athletic Field System by Kowalewski, Crum, and Rogers. Asian Golf Growth Taxes Bermudagrass's Flexibility by Wiecko. I wrote about grasses that don't die as being ones that are desirable for producing a firm playing surface in a tropical environment. This was published as Achieving the Warm Season Links in Golf Course Architecture. It's a grim outlook for ground contours on golf courses if the playing surface doesn't allow the ball to bounce and roll. On Sunday, I'll be talking about this as it relates to tropical Southeast Asia -- if one wants to have surfaces on which a golf ball is going to bounce and roll, what grasses are preferable, and what type of soil conditions do we need? This is part of the Design, Build, and Maintain: a different way? seminar with Paul Jansen and Pirapon Namatra. Do fairways need a sand cap? I'll be sharing some recent data, observations, and calculations, but those two articles give a good preview of the case I will make, and if you are attending the seminar, I hope you will read those articles in advance. If you are not attending the seminar, you'll probably like the articles anyway.